Chill out in your plush room overlooking the bay, take a morning stroll to the beach or sit and watch the fishermen at work. Ideal spot for exporing the Cornish coast by sea or land, full of hidden treasures and secluded spots. Plenty of boat rentals available, head out with a skilled skipper or charter your own course. For garden lovers, the Lost Gardens of Heligan are close by. Pass an unforgettable evening feasting on fresh fish under the stars, on the terrace facing over the English Channel. Cycling is an ideal way to explore this Area of Outstanding Natural Beauty, rentals are available nearby. Fishing trips can be organised from a multitude of local boats, a splendid days activity. Private steps lead down to a secluded bay, perfect for a evening stroll. There is a dive centre nearby, rent equippment or head out for a guided lesson. Mevagissey Village is just ten minutes down the road and is an ancient fishing village with a Grade 2 listed double harbour. They say because it is “relaxed, friendly, the service is excellent. It is in a wonderful location with most rooms enjoying sea views. The food is great. It is privately owned and run. A hotel with personality”. •	Lovely gardents and beach for relaxing. Cosy sitting room with log fire in winter. •	Explore the ancient fishing village of Mevagissey. •	The SW Coast Path is at the bottom of the garden for walkers. •	Wonderful Cornish gardens to visit, especially the Lost Gardens of Heligan and the Eden Project. •	Fishing, boat trips, golf , walking, watersports are all available locally. 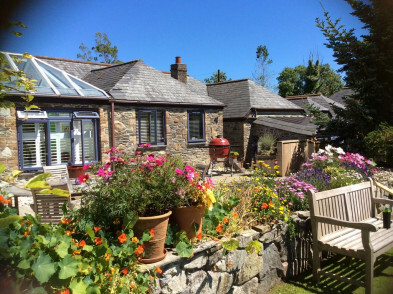 •	Good base for touring Cornwall. •	Buffet with freshly baked croissant, selection of cereals, fresh fruit salad, yoghurt etc. •	Cooked breakfasts made to order. All the items of an English cooked breakfast, smoked salmon, smoked haddock, kippers etc. Our restaurant is open each evening. We are passionate about local, seasonal foods. We can advise on many local restaurants. Which are your most popular room types and why? 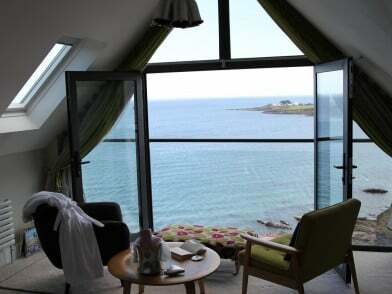 Rooms with sea views are what are most requested and fortunately, all but two of our rooms have sea views. We have rooms to suit all budgets. The family suite is popular with families of all ages, those with young children and also those bringing elderly relatives away. "enjoy the hotel's original oak panelling, open fires, glamorous restaurant (three courses from £24.50 per head), boats slipping across the bay at sunset, sea-gazing hut in the garden and the hotel's own deserted beach. " Boasts a lovely collection of paintings. Private beach accessible via a winding cliff path.